Helping mothers and children both have a break. Hoping to help those raising children, it started in 2013 and they have nursed 350 children in total (as of December 2018). Please use this service to leave your children while you freely enjoy shopping, beauty treatments, movies, etc. with peace of mind. The children will also be happy to see their refreshed parents with smiles on their faces. I was able to relax and enjoy shopping with peace of mind and had a wonderful time. I was worried because my child was almost crying when I left them, but I was happy to see that they had eaten a good snack and had fun with friends. My child running up to me saying "Mama" when I came to pick them up was very adorable. Since having children I haven't been able to go out much, but using the nursery service I was able to have a really happy time. The service is available once per month. ※In May and October, in accordance with the experience-type events being held, the service changes for the children whose parents join the experience program. Details on the experience-type events will be posted on the website. The rooms are clean and bright with windows. The following children can be accepted. Children using this service for the first time. Maximum of 7 children at least 6 months old and younger than 4 years old (at the time of nursing). Check availability in the nursery rooms here. You can make a reservation from 1 month before your desired date. Please make your application by sending your desired date, name, address, phone number, and child's age (up to 2 children) via this e-mail form, phone 06-6641-3362 (Monday-Friday, 10:00～17:00), or FAX 06-6643-0097 as shown below. The shopping street will send you detailed information and a registration form. Please fill in the registration form and send it back to the shopping street. We will prepare nursing staff according to the number of children to be watched and their ages, etc. Please come to the shopping street nursing room (Karaoke-kan Namba Ebisubashi Main Branch) after feeding them lunch. Veteran nursing staff will watch your children. Have a refreshing time freely♪ Tea! Movies! Shopping! Please come back to pick up your child by the agreed time. Since their establishment in 1996 they have been working in the fields of "child-raising", "education", and "children's rights" to create a rich environment for raising children. They are commissioned more than 120 times per year for nursing by clients including the government, and their highly experienced nursing staff will take good care of your precious children to help child-rearing mothers smile. Notes of caution: Please be sure to read. 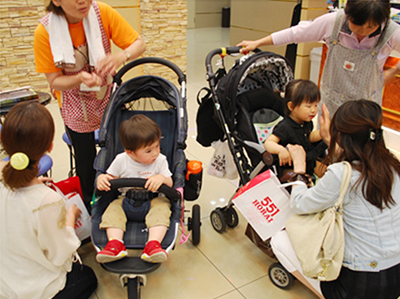 ※Please be sure to read the "Temporary Nursery Service Requirements (PDF)" before applying. ※Due to the limited number of children that can be accepted, it will be limited to those who are using this service for the first time. ※Because the children are kept in a group, please do not bring physically ill children (fevers, infectious illnesses, etc.). Please be sure to contact us if you wish to cancel. ※Please be sure to contact us if you wish to cancel for personal reasons. If you cancel without contacting us you will be unable to apply for the service in the future. This "Minami Map" includes the elevator location, nursing and diaper changing rooms, shops and facilities to enjoy with children all on one map.